In Phase 2, a multi-disciplinary, Foundation for Human Enrichment (FHE) -sponsored team lead by Lisa LaDue, M.S.W. will arrive in China in mid-July to provide an orientation to somatic intervention using an evidence-based, early intervention trauma response model called Psychological First Aid (a model developed by the National Center for PTSD, the National Child Traumatic Stress Network and the American Red Cross). The team will focus on training healthcare workers and school personnel in psychological first aid using a somatic approach to achieve psychological stabilization. This stabilization can assist many earthquake-affected individuals to access their own resiliency and coping skills thus regaining a higher level of functioning. In order to maximize efficiency and effectiveness of the team�s efforts, Ms. LaDue is collaborating with Dr. Rob Blinn, Ph.D Director of the Family Counseling Center, Beijing United Family Hospitals and Clinics. 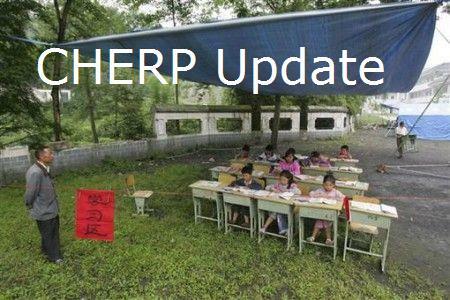 Plans are being developed to select a group of healthcare workers and school personnel who are actively involved in a limited number of work-sites in the Sichuan area in order to more deeply imprint the results of the training in key areas. An initial 1- day classroom training with each select group of trainees will be followed by at least four days in the field where team members will provide psychological first aid interventions for identified populations. Team members and trainees will work side-by-side as team members demonstrate the methods and mentor the trainees as they develop and improve their own intervention skills. Trainees will become more involved in providing interventions each day until it is determined that they can work independently of a team member. Each day in the field will be completed with a debriefing where team members will answer questions and address any secondary trauma that may arise in trainees during the workday. This will facilitate increased acquisition of knowledge and integration of knowledge and skills for trainees. It will also provide a foundation from which trainees can then provide psychological first aid intervention and training, using the curriculum materials provided by the FHE team. Workshop trainings will be evaluated for participant satisfaction and relevance using an instrument developed by Dr. Leitch, TRUSS, the Treatment Relevance, Use and Satisfaction Scale. The multi-disciplinary FHE team will be comprised of individuals who are all certified in their professional areas of expertise and have all completed the advanced level of Somatic Experiencing. All of these individuals, Dr. Laurie Leitch, Lisa LaDue, Dr. Maggie Kline, Dr. Daniel Bruce and Alejandre Duarte, were members of the original FHE Trauma Outreach Program team that worked with tsunami survivors in Khao Lak, Thailand in January of 2006. The team leader, Lisa LaDue, is the co-founder and senior advisor for the National Mass Fatalities Institute in Cedar Rapids, Iowa and has extensive international disaster response experience.